Anodal transcranial direct current stimulation (tDCS) over the primary motor cortex (M1) has been proposed as a possible therapeutic rehabilitation technique for motor impairment. 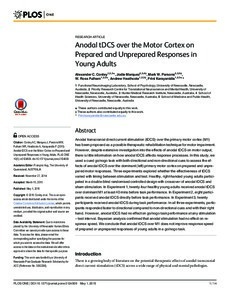 However, despite extensive investigation into the effects of anodal tDCS on motor output, there is little information on how anodal tDCS affects response processes. In this study, we used a cued go/nogo task with both directional and non-directional cues to assess the effects of anodal tDCS over the dominant (left) primary motor cortex on prepared and unprepared motor responses. Three experiments explored whether the effectiveness of tDCS varied with timing between stimulation and test. Healthy, right-handed young adults participated in a double-blind randomised controlled design with crossover of anodal tDCS and sham stimulation. In Experiment 1, twenty-four healthy young adults received anodal tDCS over dominant M1 at least 40 mins before task performance. In Experiment 2, eight participants received anodal tDCS directly before task performance. In Experiment 3, twenty participants received anodal tDCS during task performance. In all three experiments, participants responded faster to directional compared to non-directional cues and with their right hand. However, anodal tDCS had no effect on go/nogo task performance at any stimulation – test interval. Bayesian analysis confirmed that anodal stimulation had no effect on response speed. We conclude that anodal tDCS over M1 does not improve response speed of prepared or unprepared responses of young adults in a go/nogo task.